The Sangat remain in Chardi Kaleh! We pray for calm and urge the Government to release those that have completed their jail terms as per the LAW! In this picture is an 83 year old American resident, Bapu Surat Singh. 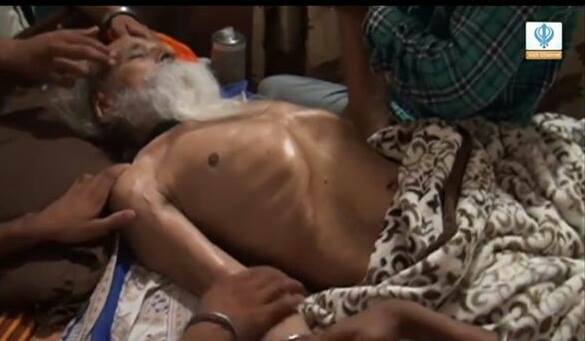 He has been on hunger strike for the past 183 days at his home village Hassanpur, Panjab, India. The reason for the hunger strike action is, he is requesting for the release of those Sikh political prisoners that have ALREADY completed their jail terms but are still languishing in Indian prisons. He is currently very weak, and does not have long to go. In this picture you can clearly see the deteriorating health of this elderly BRAVE and SELFLESS man. If you AGREE that those that have already completed their jail terms should be released as per the law, then we ask you to kindly share or like this post to help us raise awareness. Next post Videos New York :- 2 Singhs Were Arrested By Police During A Massive Protest Outside Royal Palace Banquet Hotel In Richmond Hill.